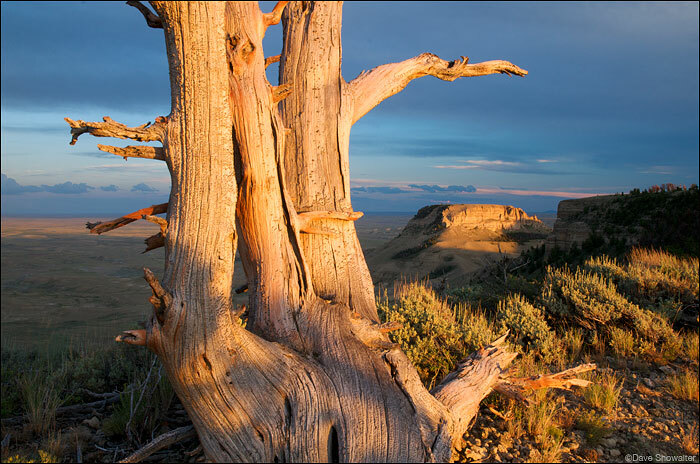 The last light of the day warms Atlantic Butte and a skelton tree on top of Pacific Butte in the Oregon Buttes Wilderness Study Area. Jack Morrow Hills, northern Red Desert. Photo © copyright by Dave Showalter. My archival prints are printed on professional paper that holds color and detail and looks great mounted. All prints are signed. The Duraplaq Standard substrate is a 3/8" HDF board that is 100% recycled, environmentally friendly and is pre-laminated on both sides and finished with a "box" frame. The finished picture has a clean look and the matte laminate greatly reduces glare, allowing you to see the image. Duraplaq mounted prints can be cleaned with your normal glass cleaning products and are extremely durable. I work to make the best possible custom prints. All of my print preparation is done in-house and I personally inspect every print before I sign and ship the prints. Your satisfaction is guaranteed. Conservation photographer and author Dave Showalter is based in Colorado and focused on the American West. Dave has published two books - Sage Spirit, The American West at A Crossroads by Braided River (2015); and the award-winning Prairie Thunder by Skyline Press (2007). Dave's photographs and articles have appeared in numerous publications, including Audubon, Conservation Biology, Outside, Outdoor Photographer, National Parks Magazine, High Country News, Wilderness, Colorado Life and elsewhere. Dave is an associate Fellow Photographer in the International League of Conservation Photographers (iLCP), and works in partnership with numerous conservation groups, including Audubon Rockies, The Wilderness Society, and Sierra Club of Wyoming. His Sage Spirit book and outreach campaign use evocative prose and images to help people understand the plight of the endangered sage grouse, and the complex issues threatening the sagebrush ecosystem in which it lives. All material © copyright by Dave Showalter. All rights reserved. Site by WideRange Galleries.